Let Go (2002), Avril Lavigne's First Album. 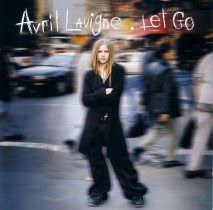 Let Go is the debut album by Canadian punk-rock singer, Avril Lavigne, released on June 4, 2002. It is a very successful debut album, received eight Grammy Award nominations, and managed to get 7 times Platinum certification in the U.S., in Canada 11 times, 5 times in Britain, 7 times in Australia, New Zealand 4 times, and 1 time in Japan. In Canada, the album received the Diamond award for selling over 1 million copies less than 1 year (11 months). Occupy position 1 in United World Chart for 7 weeks. To date, the album has sold more than 18 million copies worldwide, and is listed in 74th position in the All-time United World Chart selling album, and the position of 8 for the decade of the 2000s Avril to record a song titled "Let Go", but not included in the list of songs of this album. He first appeared directly in front of the public in the Try To Shut Me Up Tour, January 23, 2003 and released the My World DVD whose content is appearance. At first, Let Go will be named Anything But Ordinary. The success of Avril's debut album is often juxtaposed with the success of her debut solo artist album of punk-rock from another Canadian, Alanis Morissette Jagged Little Pill entitled who get certified 16 times Platinum in the U.S. and sold more than 37 million copies worldwide, and also the debut album most successful of all time.